All aboard for building, and ride the fast track to counting! Learning numbers is easy as 1,2,3 when your little builder uses three big wheelbases, special parts, and building blocks with numbers on them to build a friendly train or brightly colored station. 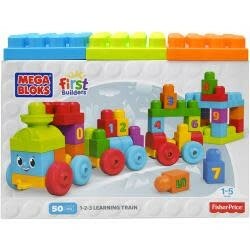 With each of the numbers 0 through 9 featured twice in this playset, you can stack the colorful blocks on the wagons, or match them together for lots of counting fun! This set features three big building plates that you can use to build your train station or anything else you imagine! Ideal for ages 1 to 5.